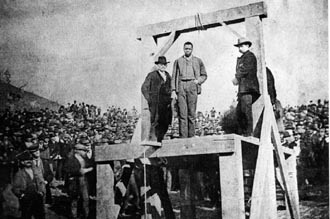 On this date in 1894, West Virginia hanged before a crowd of 3,000 for a mining camp murder three months before. Hardy was reportedly already at odds with Thomas Drews, a fellow laborer in the booming Appalachian coal industry, over their mutual pursuit of the same woman when Hardy lost big to Drews in a craps game on October 13, 1893. One of the most popular folk ballads in American history, the song has foggy origins but amazing reach: it has been performed, covered, and reinterpreted by a scores of artists including the Carter Family, Lead Belly, Duke Ellington, Woody Guthrie, Pete Seeger, and Bob Dylan with the Grateful Dead.